Organic food is a multibillion-dollar industry in the United States with growing pains it wants Congress to help soothe. 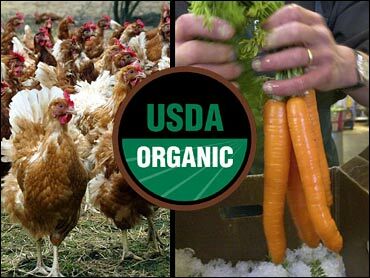 At issue is whether small amounts of non-organic ingredients, vitamins, spices, citric acid, even carbonation, should be allowed in food bearing the "USDA Organic" seal. An appeals court decided earlier this year that none of those things belongs in food labeled as organic. Lawmakers could decide as early as Tuesday whether they want to override the ruling. The dispute started with Arthur Harvey, an organic blueberry farmer from Maine. Harvey sued the government in 2002 for allowing products containing synthetic ingredients to be sold as organic, among other things. "The basic principle of the law is that anything labeled organic has to be 95 percent organic and 100 percent natural. I think that's a pretty simple principle," Harvey said in an interview. The idea may be simple for Harvey and farmers like him to follow, but it's more complicated when food is processed. To make blueberries into jam, for example, or milk into yogurt, thickening usually requires pectin. Pectin comes from fruit peels, but because of how it's made, it's considered synthetic. That is why, over the years, the government has allowed pectin and dozens of other non-organic or synthetic ingredients into processed food. Food labeled "organic" must have at least 95 percent organic ingredients; exceptions for pectin and other ingredients apply to the other 5 percent. At New Hampshire-based Stonyfield Farm, the biggest organic yogurt maker, the court ruling jeopardizes 90 percent of the company's products, said Nancy Hirshberg, a company vice president. If the ruling stands, she said, Stonyfield will have to replace the organic seal with the phrase "made with organic ingredients," a less marketable claim. "Consumers aren't interested," Hirshberg said. "If we can't call it organic, and that means also charge the organic premium, can we really afford to make it as organic?" According to an industry estimate by the Organic Trade Association, the lawsuit will cost manufacturers $758 million in annual revenues. Cottage cheese is among many foods on the line for Organic Valley Farms, which uses carbon dioxide to get a cleaner, longer-lasting product. The Wisconsin-based national farm cooperative is even more worried about another aspect of the court ruling requiring dairy farmers to feed their cows 100 percent organic feed in the year before their milk is sold as organic; the government has allowed 20 percent conventional feed for part of that year. "I feel very strongly we should try to regain what was lost," said George Siemon, chief executive of Organic Valley. The government's definition of organic means grown without pesticides, antibiotics, growth hormones or genetic engineering. The industry is still a small segment, just 2 percent, of food and beverage sales. But it continues to grow rapidly, from $1 billion in 1990 to an estimated $14.5 billion this year, according to the Organic Trade Association. It started with small-scale farmers such as Harvey and companies such as Stonyfield, but today it has attracted major players such as Archer Daniels Midland Co. and Kraft Foods. More than 200 companies and trade groups are asking Congress to override the court ruling in spending legislation for agriculture programs, which negotiators are scheduled to consider on Tuesday. Congress has been reluctant to deal with the topic. After pressure from the food lobby last month, the Senate included an amendment to the spending bill ordering the Agriculture Department to study the impact of the court ruling. Consumer groups say the integrity of organic food is at stake and have generated more than 200,000 letters to Congress against the companies' efforts. It's a "sneak attack" on standards for organic food, said Ronnie Cummins, president of the Organic Consumers Association. People don't expect food labeled "organic" to contain artificial ingredients, said Urvashi Rangan, a scientist for Consumers Union. The industry wants to be able to use the organic seal without shouldering the burden of people's expectations, she said. Harvey said money is at stake. "As soon as you require a product to be manufactured from all-natural ingredients, it costs more. I don't deny that," he said. "They're in business to make money. If it's cheaper for them to get the rules changed than it is to use all-natural ingredients, well, that's the way they'll go."